Understanding canine locomotion and gait is imperative to diagnosing numerous musculoskeletal and neurologic conditions. Prior to any orthopedic or neurologic examination, a gait evaluation should be performed. Gait evaluation typically includes visual and/or subjective observation of the dog from a number of angles at both the walk and trot on a flat surface. To the trained eye, lameness can often be detected upon gait evaluation. However, a more subtle lameness may not be apparent on subjective gait evaluation and can be difficult to detect. Recently, new validated objective gait analysis technologies have become available to help veterinarians quantitate characteristics of gait, which can greatly assist in the detection of a subtle lameness as well as response to various treatments. 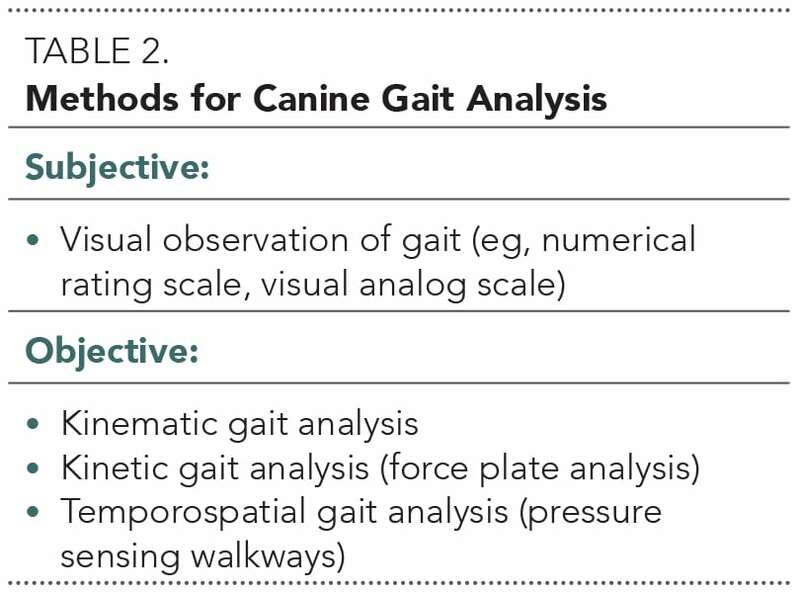 Prior to detecting abnormalities in gait, one must understand normal canine locomotion. In dogs, there are 4 main gaits: walk, trot, canter, and gallop (Table 1). Noting any signs of neurologic abnormalities, such as ataxia, paw scuffing, or stumbling. While the walk is often the easiest gait in which to observe abnormalities because it is the slowest gait, a mild lameness may not be detectable. The trot is the best gait to use for detecting lameness as it is the only gait in which the forelimbs and hindlimbs never receive assistance from the contralateral limb in bearing weight. Generally, with forelimb lameness, weight is shifted caudally, and the head goes “down on the sound” limb or, conversely, the head goes up when the lame limb is on the ground (although this observation has not been verified in dogs). In forelimb lameness, the hindlimbs may also appear tucked under and the back appear arched, and affected dogs may take short strides with the hindlimbs. Dogs with a shoulder lameness tend to appear short strided, while dogs with an elbow lameness (eg, medial compartment disease) appear to circumduct the limb to ease pressure on the medial aspect of the elbow. On the contrary, with hindlimb lameness, weight is shifted cranially. The forelimbs may be placed more caudally, with the head and neck extended and lowered to help offset weight from the hind end. A “hip hike”—in which the hip on the lame side has increased vertical motion, making the hip on the unaffected side appear lower when observing the gait from behind—is often noted on the same side as the lameness. The tail may also rise as the lame leg contacts the ground. It is imperative to have a means for objective gait analysis because gait is difficult to consistently and reliably assess subjectively. Objective analysis is especially important when developing treatment plans and monitoring patient progress. 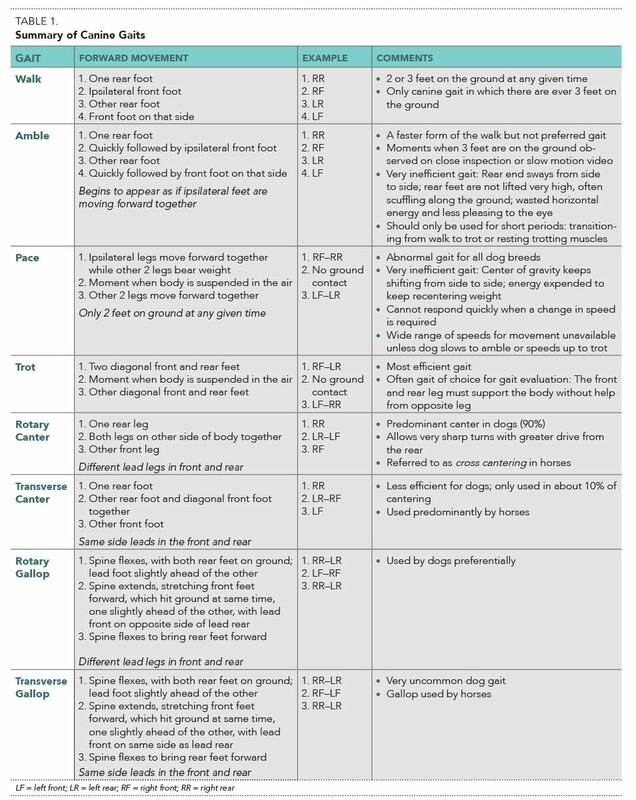 Numerous methods for gait analysis have been developed (Table 2). A systematic and disciplined approach must be used to clinically evaluate a patient’s gait. To document this clinical evaluation in the medical record, findings are often semiquantified using a numerical rating scale (Table 3) or visual analog scale (Figure 1). FIGURE 1. Example of the visual analog scale (VAS): The animal is graded on a 10-cm line, with one end of the line representing “sound” and the other end representing “non–weight-bearing.” An “X” is placed along the scale, noting the degree of lameness, and then the VAS can be placed into the patient’s record. Either the veterinarian or a trained staff member typically completes the VAS. Previous VASs can be compared to determine if there is improvement, decline, or no change. Both types of scales were developed to provide a systematic approach to visual observation of gait. However, it is important to realize that, while visual or subjective gait analysis is often helpful in identifying lameness, the gold standard for quantifying lameness is quantification of gait characteristics with a form of objective gait analysis, such as force plate analysis. Evans and colleagues compared visual observation of gait to force plate analysis.2 This study evaluated 148 Labrador retrievers—131 that were 6 months post surgery for unilateral cranial cruciate ligament injury and 17 that were free of orthopedic disease. The observer only identified 11% of the 131 dogs that were 6 months post surgery as being abnormal compared with force plate analysis, which revealed that 75% of the 131 dogs failed to achieve ground reaction forces consistent with sound Labrador retrievers. While force plate analysis has been shown to be superior to visual observation, visual observation is still a practical tool in clinical practice, and its importance should not be discounted. visit tvpjournal.com and select Clinical Resources to download the numerical rating scale and visual analog scale described in this article. The scales have been kindly provided by Veterinary Orthopedic & Sports Medicine Group. Kinematic gait analysis quantifies the positions, velocities, acceleration/deceleration, and angles of various anatomic structures in space. Most kinematic gait analysis systems use colored, retroreflective, or light-emitting diode (LED) markers that identify specific anatomic landmarks (Figure 2). FIGURE 2. Example of how reflective markers would be placed for a patient undergoing kinematic gait analysis. A few of the most common locations for markers include the dorsal scapular spine, acromion/greater tubercle, lateral humeral epicondyle, ulnar styloid process, iliac crest, femoral greater trochanter, femorotibial joint, lateral malleolus of the distal tibia, and spinous process at T13. Typically, markers are attached by shaving and cleaning the skin with alcohol; then pressing the marker’s adhesive back directly to the skin. The marker can be further secured with tape, if needed. 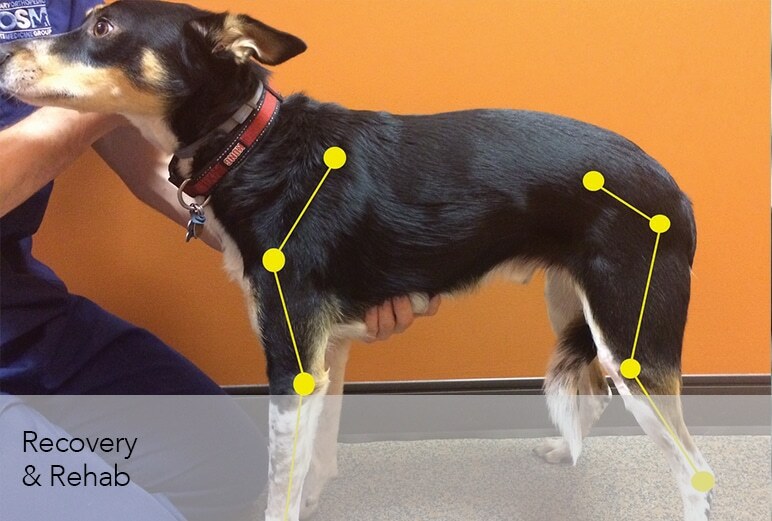 When the dog is in gait, the movement of the markers is tracked by a series of cameras. 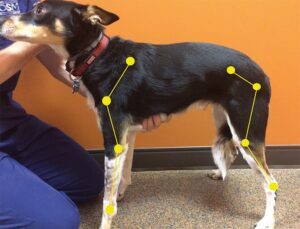 The locations of the markers over time are then used to create a 2- or 3-D model of the dog’s gait with calculations of bone and joint excursions. 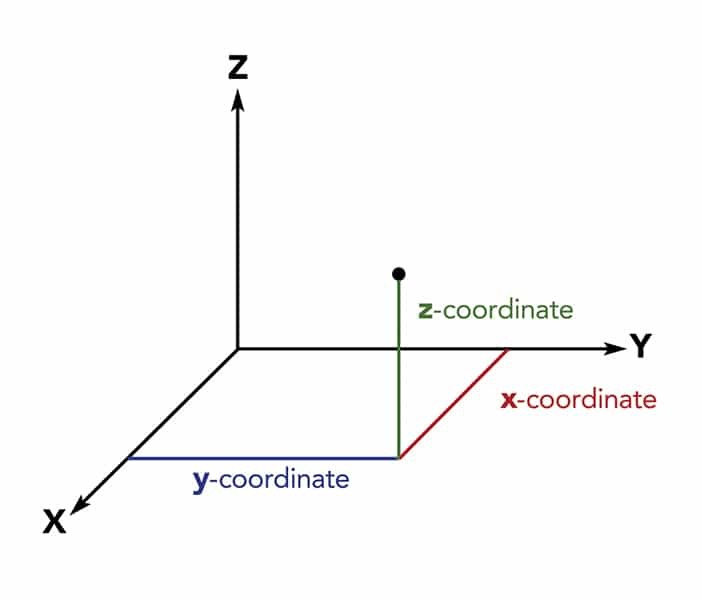 Displacement is the distance recorded when a marker changes position. Angular velocity is the speed at which this change occurs. Range of motion is calculated from the displacement at a specific joint. While a multitude of information can be gathered from this form of gait analysis, one major limitation is the variation of structures between breeds, as well as within breeds.3 Further limitations include the potential for skin movement, and accuracy and repeatability of marker placement. Kinetic gait analysis measures the ground reaction forces that are the result of an individual’s step. The most commonly used method for kinetic gait analysis is force plate analysis, in which metal plates are mounted on the floor or walkway (Figure 3) to measure ground reaction forces (Table 4 and Figure 4). The forces are measured in 3 dimensions: vertical, craniocaudal, and mediolateral. FIGURE 3. 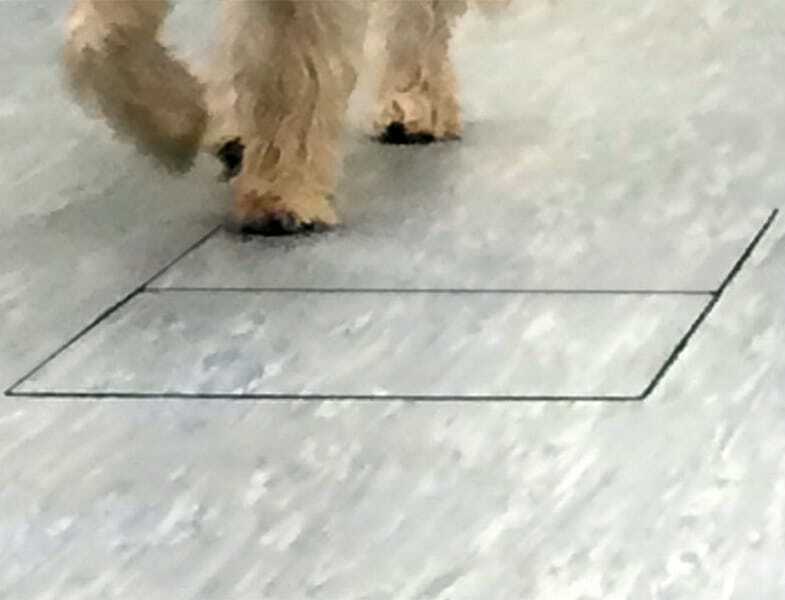 A force plate walkway; note the gray square in the center of the mat—this is the force plate that the dog must step on during the analysis. 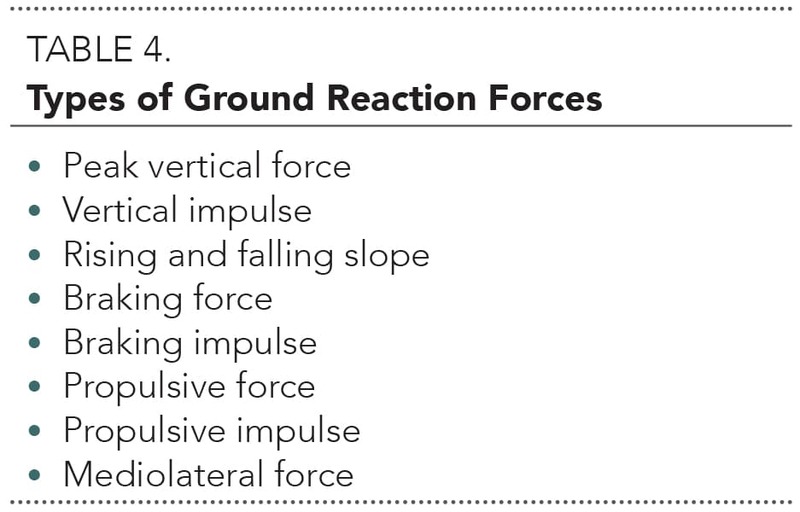 These forces are often presented graphically, with the peak forces as the maximum forces generated in the described phase of gait, represented by the force–time curve. The impulse is then represented as the area under the force–time curve. Peak vertical force (PVF) is the single largest force during the stance phase and represents only a single data point on the force–time curve. 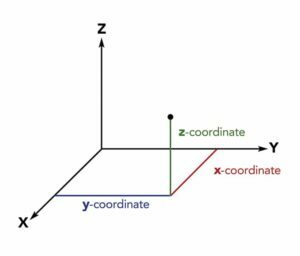 Vertical impulse (VI) can be derived by calculating the area under the vertical force curve using time. PVF and VI are the two most commonly used indices to detect lameness3-5 and, in general, a dog with lameness has a lower PVF and VI in that limb. 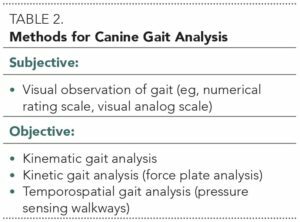 Force plate measurements have been the most widely used and validated quantitative gait application in veterinary medicine to date.3 Thus, force plate analysis is considered the optimum approach to quantification of gait characteristics by objective gait analysis. Cost and impracticality for clinical practice. Walk or trot the dog down the mat at a consistent velocity or steady state gait. Keep dogs on a loose leash, their heads looking forward in the direction of travel, and moving down the center of the mat. Place the mat in a quiet location where dogs won’t become easily distracted. Start the pass 2 meters before the mat to encourage the dog to be straight and maintain a steady gait prior to stepping on the mat. If the dog has been trained for competitions, such as agility or obedience, it is most helpful to have the owner run the dog on the mat; otherwise, have the owner leave the room and have technical staff run the dog over the mat. Practice with the dog before recording to acclimate the dog to the mat and surroundings. Do not look at the dog while it is gaiting; this almost invariably makes the dog look at the owner or handler, although it might take three to four passes for this to work. If there is uncertainty regarding whether or not the pass down the mat was acceptable, it is often possible to review the video footage captured by the software’s camera. Pressure sensing walkways have been validated to analyze normal and abnormal gaits in dogs.6-13 Having this information aids in diagnosing orthopedic, muscular, and neurologic disorders that affect gait. These measures provide novel information about temporal and spatial gait characteristics (Figure 5). FIGURE 5. Results from temporospatial gait analysis using a pressure sensing walkway in a patient with a left cranial cruciate ligament rupture. Dogs carry about 60% of body weight on their forelimbs and 40% of body weight on their hindlimbs. Thus, the total pressure index percentage should be 30% in each forelimb and 20% in each hindlimb. This patient is placing 17% on the left hindlimb and 21% on the right hindlimb. 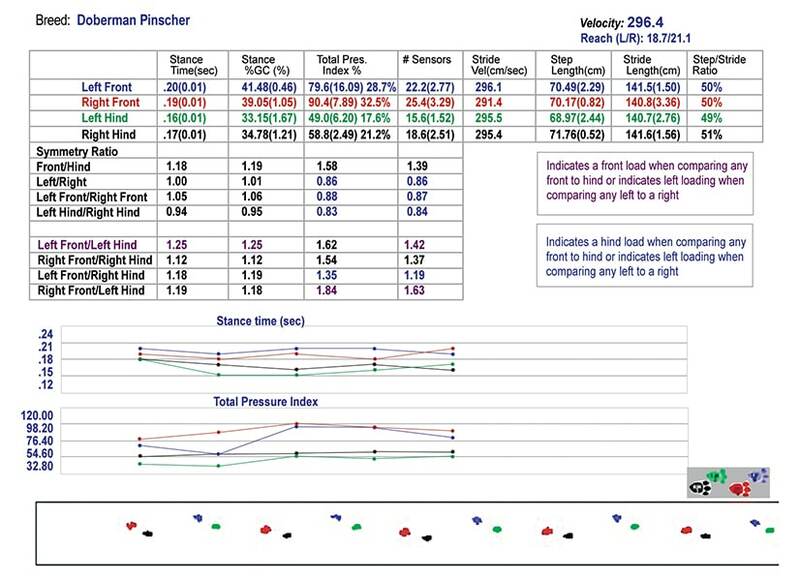 Temporospatial gait analysis uses a pressure sensing mat (Figure 6) and computer software system to calculate velocity, stance time, swing time, stride length, step length, and total pressure index (Table 5). FIGURE 6. 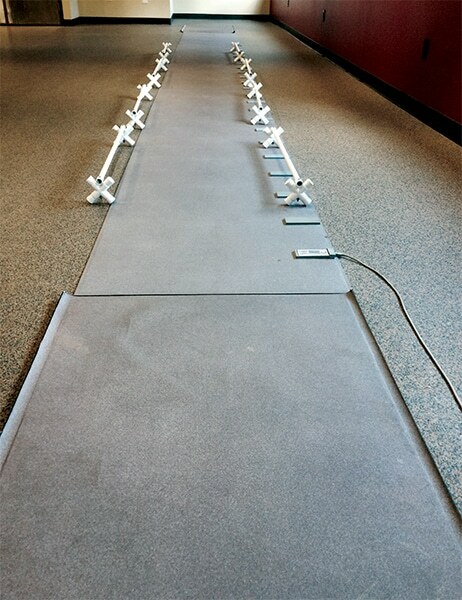 A temporospatial gait analysis system; note the series of sensors on the right side of the mat that are used to record each foot strike to calculate velocity, stance time, swing time, stride length, step length, and total pressure index. The sensors are connected to a computer (not pictured) with software to allow the gait to be analyzed. 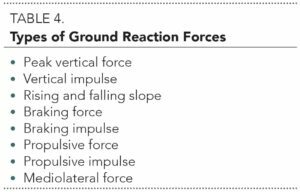 Forces exerted to change speed, change direction, or maintain balance can interfere and complicate measurement interpretation.12,16 The pressure sensing walkway does not measure force directly but does measure the influence of these forces. Therefore, by limiting excess external influences, the measurements may be more representative of the dog’s true gait. With more dogs participating in activities with their owners, canine sports, or a working role, it is essential for owners and veterinarians to understand canine gait. Early signs of lameness may be as subtle as a shortened stride or shorter stance time on the injured leg. Both subjective and objective gait analyses are important to not only establish a diagnosis but also monitor progression of treatment. Zink MC. Locomotion and athletic performance. In Zink MC, Van Dyke JB (eds): Canine Sports Medicine and Rehabilitation. Ames, IA: Wiley-Blackwell, 2013, pp 19-31. Evans R, Horstman C, Conzemius M. Accuracy and optimization of force platform gait analysis in Labradors with cranial cruciate disease evaluated at a walking gait. Vet Surg 2005; 34(5):445-449. Gordon-Evans WJ. Gait analysis. In Tobias KM, Johnston SA (eds): Veterinary Surgery: Small Animal. St. Louis: Elsevier, 2012, pp 1190-1196. Gillette RL, Angle TC. Recent developments in canine locomotor analysis: A review. Vet J 2008; 178:165-176. Nunamaker DM, Blauner PD. Normal and abnormal gait. In Newton CD, Nunamaker DM (eds): Textbook of Small Animal Orthopaedics. Philadelphia: JB Lippincott, 1985, pp 1084-1085. Light VA, Steiss JE, Montgomery RD, et al. Temporal-spatial gait analysis by the use of a portable walkway system in healthy Labrador retrievers at a walk. Am J Vet Res 2010; 71(9):997-1002. Besancon MF, Conzemius MG, Derrick TR, Ritter MJ. Comparison of vertical forces in normal greyhounds between force platform and pressure walkway measurement systems. Vet Comp Orthop Traumatol 2003; 16(3):153-157. Lascelles BD, Roe SC, Smith E, et al. Evaluation of a pressure walkway system for measurement of vertical limb forces in clinically normal dogs. Am J Vet Res 2006; 67:277-282. Webster KE, Wittwer JE, Feller JA. 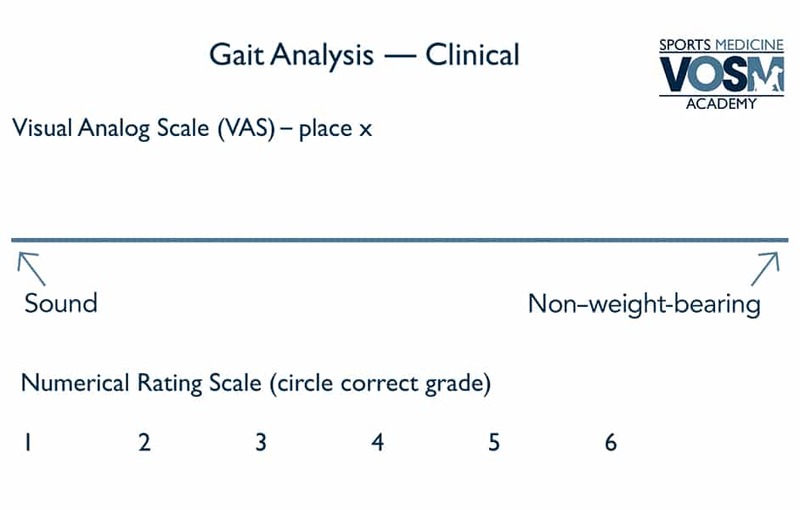 Validity of the GAITRite walkway system for the measurement of averaged and individual step parameters of gait. Gait Posture 2005; 22:317-321. Gordon-Evans WJ, Evans RB, Conzemius MG. Accuracy of spatiotemporal variables in gait analysis of neurologic dogs. J Neurotrauma 2009; 26:1055-1060. LeQuang T, Maitre P, Roger T, Viguier E. Is a pressure walkway system able to highlight a lameness in dog? J Anim Vet Adv 2009; 8:1936-1944. Keebaugh AE, Redman-Bentley D, Griffon DJ. Influence of leash side and handlers on pressure mat analysis of gait characteristics in small breed dogs. JAVMA 2015; 246(11):1215-1221. Carr BJ, Canapp SO Jr, Zink MC. Quantitative comparison of the walk and trot of border collies and Labrador retrievers, breeds with different performance requirements. PLoS ONE 2015; 10(12): e0145396. doi:10.1371/journal.pone.0145396. McDonough AL, Batavia M, Chen FC, et al. The validity and reliability of the GAITRite system’s measurements: A preliminary evaluation. Arch Phys Med Rehabil 2001; 82:419-425. Bilney B, Morris M, Webster K. Concurrent related validity of the GAITRite walkway system for quantification of the spatial and temporal parameters of gait. Gait Posture 2003; 17:68-74. Voss K, Galeandro L, Wiestner T, et al. Relationships of body weight, body size, subject velocity, and vertical ground reaction forces in trotting dogs. Vet Surg 2010; 39(7):863-869. Brittany Jean Carr, DVM, CCRT, is currently a rehabilitation therapist and American College of Veterinary Sports Medicine and Rehabilitation resident at Veterinary Orthopedic & Sports Medicine Group (VOSM) in Annapolis Junction, Maryland. Dr. Carr earned her DVM from Virginia–Maryland College of Veterinary Medicine (Virginia Institute of Technology). She completed a small animal rotating internship at the Animal Specialty Group in Los Angeles, California, and a surgical internship at VOSM. David L. Dycus, DVM, MS, CCRP, Diplomate ACVS (Small Animal), is a staff orthopedic surgeon at Veterinary Orthopedic & Sports Medicine Group (VOSM) in Annapolis Junction, Maryland. He has presented at national meetings, lectured second- through fourth-year veterinary students, and published an array of research articles and a book chapter. Dr. Dycus received his DVM from Mississippi State University, completed a rotating internship at Auburn University, and earned his MS and completed a small animal surgical residency at Mississippi State University.